To create my card - I colored the back of my Happiness is a Journey stamp, with markers, lightly misted then stamped onto my confetti card stock. It give is a nice watercolor look. If you'd like to play along with this weeks challenge, simply leave a link to your creation on this blog post, or if you upload to SCS, please use keyword BC60. I really like your choice of colours in this Lisa, love the sentiment too. Gorgeous card! This stamp set reminds me of my g'pa, who worked on the railroad most of his life and collects trains. Fabulous card, Lisa...and a wonderful technique. Loving those autumn colors. Beautiful card, the background is fantastic!!! Happy Birthday Joe!!! What a great card. I love the colors. Wish your son a Happy Birthday from me too. WOW Lisa, I absolutely love this card. The colors are masculine and autumn. Just gorgeous! TFS! Happy Birthday to your son! 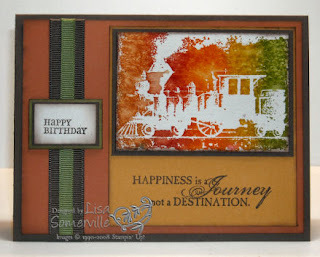 Love your card...great masculine colors and stamp! Very cool! HB to the DS! This card is stunning!! I love the marker effect you've created on your focal image!!! Hope your son had a happy, happy day!!! Awesome card, Lisa! The marker misting on the train is a very cool effect! Very cool card! I love how the colors pop! Oh lisa what a fabulous card for the challenge. Love that set. You really achieved some creative hightlights with the train image. Very nice! I love the image (it reminds me of my dad who loved model trains) and your colors are wonderful. Happy BD to your son too. Wasn't sure about this set, but of course, you made it look fabulous! 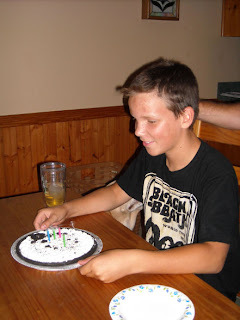 Even though 13 year old boys can be tough, I bet your son loved it....It's so grown up looking! What a wonderful card! Full of texture and color! Happy Birthday to your son. 13 is such a fun year! BEautiful Lisa! Just stunning colors. Happy Birthday, Joe! Two teens? Eeks! Love what you did with this stamp set! It is a totally Lisa set!!! Beautiful card! This is great! Love what you did with the image. Perfect technique (and color combination) for that image, Lisa. Hope Joe had a great day!